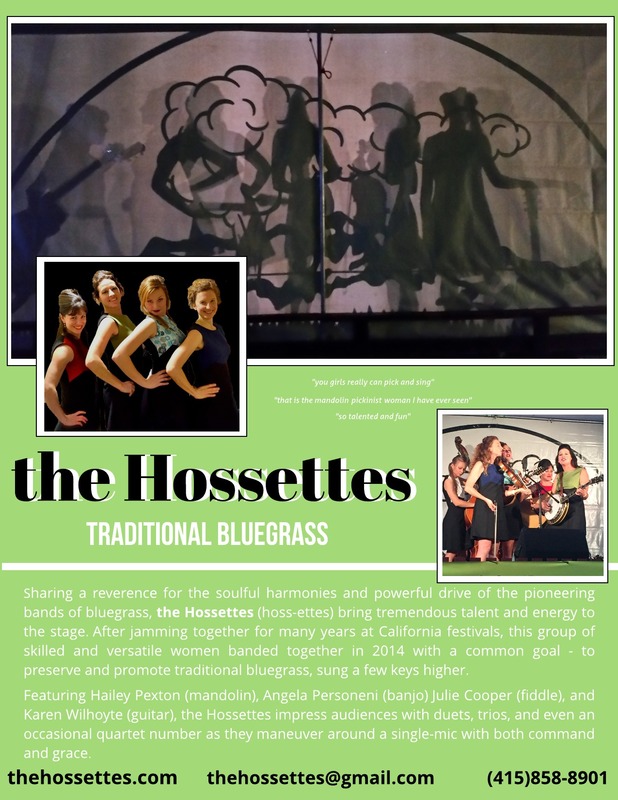 Sharing a reverence for the soulful harmonies and powerful drive of the pioneering bands of bluegrass, the Hossettes (hoss-ettes) bring tremendous talent and energy to the stage. 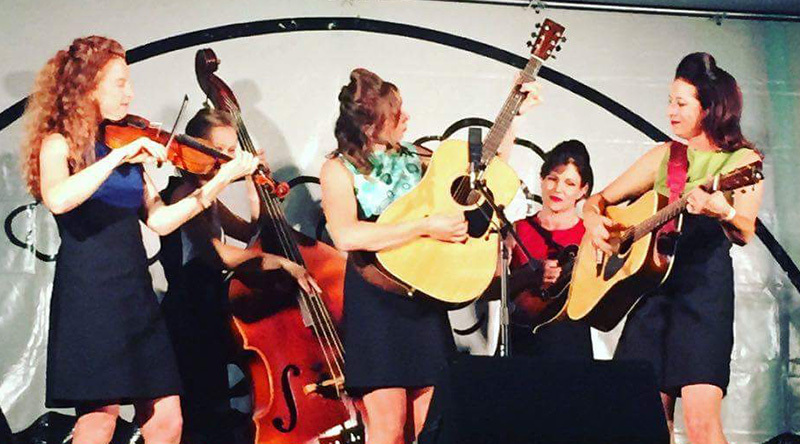 Featuring Hailey Pexton (mandolin, guitar, vocals), Angela Personeni (banjo, vocals), Julie Cooper (fiddle, vocals), Karen Wilhoyte (guitar, bass, vocals), and Larissa Pilatti (bass, vocals), the Hossettes impress audiences with duets, trios, and even an occasional quartet number. In addition to their traditional repertoire, they also perform original songs, which offer a fresh sound while maintaining the band’s firm roots in classic bluegrass. In between her lead and harmony vocals in the band, Hailey likes to serve up some energetic, traditional-style mandolin. She conjures the heart and soul of mountain music and the bluegrass. When not birthing goats, digging 40 pounds of garlic out of her garden, or teaching high school students, Angela finds the time for her true love – playing bluegrass music. She is a multi-instrumentalist and is well known in California for her solid, driving bass playing. On the banjo, she is often regarded as a female Ralph Stanley in both taste and tone. After attending her first Father’s Day Bluegrass Festival in 2003, Julie was deeply inspired and determined to learn fiddle tunes and return the next year to pick in a jam. Julie enjoys playing traditional bluegrass because of its emphasis on instrumental breaks and tight vocal harmonies. Her favorite fiddlers include Bobby Hicks, Kimber Ludiker, John Mailander and many more. Julie joined the band in 2015and is excited about the band’s future. Larissa first learned about Bluegrass music in 2011 on what she describes as “the best family vacation of her life.” Since then, she has listened and studied hard to all the traditional Bluegrass she can lay her hands on, and it shows. Larissa’s drive and taste are an exhilarating breath of fresh air, not to mention, she already owned a pair of go-go boots!